On October 24, our team took part to the International Poultry Forum within the annual Zootechnic Faire held in Cremona. This is one of the most important events in Europe for the poultry breeding. 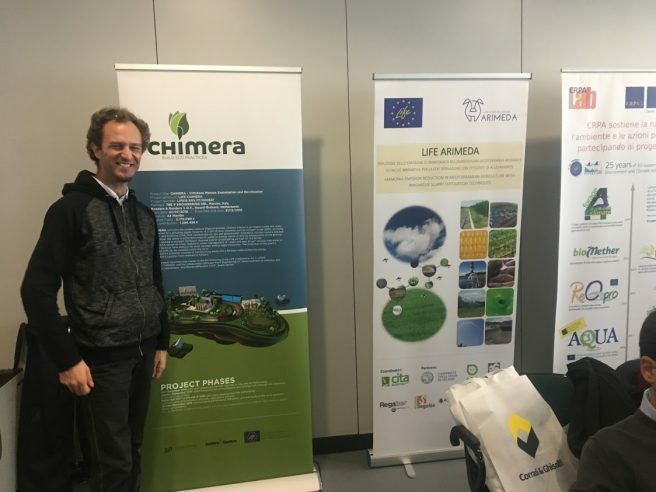 3P Engineering was invited to participate in a workshop jointly organized by three other LIFE Projects: LIFE+ Forage4Climate that investigated how fodder forage influence on climate change; LIFE DOP on the circular economy in the dairy industry of excellence; and LIFE ARIMEDA working on the reduction of ammonia emissions through innovative fertigation techniques. The workshop was about the best management of zootechnical waste to reduce greenhouse emissions. This objective coincides with one of the main aims of CHIMERA project and, importantly, our ambition is to replicate the CHIMERA solution also to other farming industries other than chicken such as cattle and pigs. The confrontation with other LIFE Projects aligned on the same objectives, allowed 3P Engineering to gain a better insight on the industry and on the state of the art of the research in the various sectors. During the event, we have also met Giuseppe Uberti of the Free Association of Cremona’s Farmers (Liberacr), member of our Advisory Board. Both the workshop and the faire itself have been a great occasion for networking! For more pictures, please check our photogallery and stay tuned: we are going to ECOMONDO in a few days! Next PostECOMONDO: CHIMERA’s got talent!